DevilDriver will release their seventh album Trust No One on May 13 via Napalm Records. The follow-up to 2013’s Winter Kills was produced by Mark Lewis (Cannibal Corpse, Coal Chamber) and recorded at Florida’s Audio Hammer studios. The set marks the band’s first project with guitarist Neal Tiemann and drummer Austin D’Amond, after the departures of Jeff Kendrick and John Boecklin last year. Guitarist Mike Spreitzer admits he’s thrilled with the results of the sessions. Mainman Dez Fafara adds: “Lyrically it goes to a realistic space exploring a ton of different emotion and headspaces regarding being human and what it means to exist. The band worked long hours writing as well as in the studio along with our producer to forge Trust No One. The California outfit have issued previews of two songs from the album ahead of its release. 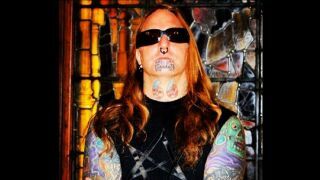 DevilDriver are gearing up to launch Trust No One with a series of US live dates starting in Las Vegas on April 27, and will return to the UK in August as support for Ministry. The tour will see the lineup debut of former Wayne Static guitarist Diego Ibarra (a.k.a. Ashes) on bass, filling the role vacated by former Bury Your Dead guitarist Chris Towning.